Pastor Marv brings focused training and broad experience from nearly 20 years of serving as an intentional interim pastor to 7 churches of various sizes, locations and diverse cultures. Pastor Linda brings training and experience as an educator and hospital chaplain from her years of ministry as a US Army chaplain. Marv and Linda have firsthand experience of the value of healthy transitions in the life of a church. Having Spirit-led pastoral leadership in the transition between permanent senior pastors enables ministry to move forward smoothly. It builds the confidence of members, regular attenders and visitors alike in an optimistic future for the church. Marv and Linda are both intentional about faithfully teaching and preaching God’s Word with relevant application for life today. They love to help congregations develop deeper spiritual passion, engage in strategic planning, reach higher levels of church health and develop new ministry initiatives. They truly desire to help build a church that will be effective in fulfilling the Great Commission. Marv enjoys providing passionate biblical preaching and Linda is a gifted teacher with a strong educational background. Linda’s background as an Army chaplain has given her significant experience in the area of pastoral care. Marv’s has provided coaching to church boards and pastoral search committees enabling churches to call a pastor who will have a vibrant long-term ministry to the church. Jen has been on the Children and Youth team for years and helped with Junior High and High School Youth Groups. She took over the role of Children and Youth Director in January 2016. She plans activities for the youth, maintains relationships, coordinates Mission Trips and other trips, and oversees all youth activities in the church. Jen is from Manson, where she previously taught 3rd grade. She is married to Mark Pearson who farms and coaches boys basketball. She likes biking and following her children in their activities. Joni Gerdes and Shari Nesbitt share the secretary responsibilities. Joni is the office secretary during the school year and Shari serves as the secretary during the summer months. ​Joni has lived her whole life in the area. She is married to Jason Gerdes, who farms. They have three children, Jacob, Jack, and Jadyn. Joni actively follows her children in their activities. She enjoys running in her spare time. ​Shari graduated from Cedar Valley High School in Somers, Iowa and went on to Iowa State University where she earned a BA degree in journalism. She returned to Iowa State and received a BA in English and obtained her teaching license. She started teaching at Rolfe High School in 1987 and has been teaching at Pocahontas Area High School since 1990. Shari teaches high school English, where she has all freshmen and all juniors and elective classes. Shari also is the director of the Play. In her years teaching she also has coached Speech and Mock Trial. ​Shari is married to Craig Nesbitt and they have two children, Melanie and Lynette. 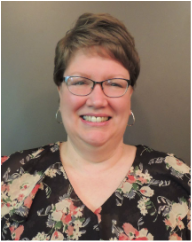 Shari enjoys attending HS activities and watching Twins baseball. In her spare time she likes to scrapbook.